Orbitron Satellite tracking system for radio amteur and observing puposes It's also used by weather professionals, satellite communication users, astronomers, UFO hobbyist and even astrologers. 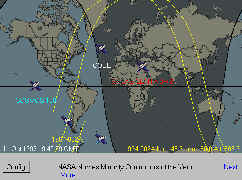 Application shows the positions of satellites at any given moment (in real or simulated time). It's FREE (Cardware) and it's probably one of the easiest and most powerful satellite trackers, according to opinions of thousands of users from all over the world. The tracking system calculates an approximate location for a list of satellites. A new free Windows satellite tracker programm called SatScape is now available. Satscape a specialised program that predicts where satellites are at the moment. You have also a World view, Horizon views, tabular list and a keppler update via your Internet connection. Radek Vaclavik OK2XDX has developed a very simple downconverter for Meteosat . He has published it on the QSL Net from here you can download also some Meteosat WAV files. Les Hamilton, UK has launched a new Satellite tracking program called Footprint. Footprint is program which displays the positions of an orbiting satellite and its footprint on a map of the Earth, updating its position and footprint every minute. The program can also provide reference tables of relevant ephemeris, A.O.S. and keplerian element data. NOAA, USA; Meteor Okean and Resurs, Russia; Sich, Ukraine. Download your copy of Footprint from Les HamiltonWeather Satellite Image Pages, free software and using WXSat. On May 05 1998 I have received the first APT Image from Meteosat 7, it was disseminated via Meteosat 6 channel 1 at 0823 UTC. I have decoded this Image with JVComm32 and EasyDSP. For download go to Weekly Picture. Weather Satellite Menu from Wyzcom. Systems West Satellite receiving systems. Introduction to Chinese Polar-Orbiting Meteorological Satellite. Building a totally Inexpensive Portable APT Station. RIG The Remote Imaging Home Page. Les Hamilton Weather Satellite Image Pages. Tutorialson basics of Satellite Remote Sensing. Receiver kit for Weather Sat´s. Setup for Polar orbiting and Geostationary Weather Satellite Reception (9K). Two-Line Orbital Elements: What´s in it ? WEFAX Binary Coded Header: What´s in it ? Polar Recorder schedules: What´s in it ?